Anthologize – Next Evolution in Blog to Book Tools?
. . . [the] project was inspired by the model of rural “barn-raisings” to bring twelve dynamic individuals to CHNM with the mission to create, build, and release a digital tool useful to humanities scholars in seven days. The project offered the team a short course in the principles of open source software development, collaborative project management, and community outreach. The project’s team included professors, graduate students, recent undergraduates, museum professionals, librarians, and digital humanities staff. In a nutshell, Anthologize lets authors quickly gather information from blogs and combine it with their own posts to create electronic documents, published in a variety of formats including PDF and ePUB. Inside the tool, you can set up projects which consist of “parts” (chapters) and items (“content”). These can come from your own posts or be imported via feeds from other sites. You can drag and drop items to any place within the project. The strength of the tools is that it leverages all of the WordPress capabilities in terms for pulling together a rich variety of content. and provides an organizational structure well suited to a book. While powerful, the tool isn’t perfect. A review by Teleogistic flagged some of its weaknesses – e.g. in the export process. None of these export processes are perfect. Some require that certain libraries be installed on your server; some do not offer the kind of layout flexibility that we like; some are not great at text encoding; etc. This release is truly an alpha, a proof-of-concept. However, the reviewer acknowledges that the tool is a potent framework for further development in the world of independent authorship, publishing, and distribution. 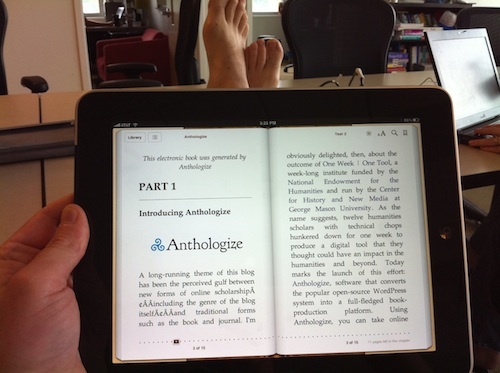 Anthologize is clearly a major step forward in the evolution of blog to book. It gives authors a way to organize their blog posts, as well as externally derived information, into a coherent book structure and then publish in formats that are suitable for print or e-book. One can easily imagine Anthologize becoming a must have base tool for authors that others developers contribute to through complementary plugins – much like the NextGen Gallery plugin has become in the image gallery arena. Anthologize can be downloaded and installed from the tool website’s download page, or you can download it from the plugins section on Wordpres.org. Check it out! Can a Computer Write a Novel? This entry was posted in author tools, blog to book, blogs & writers, open publishing, publishing technology and tagged Anthologize, blog to book tools, e-book publishing tool, plugins, Wordpress. Bookmark the permalink.